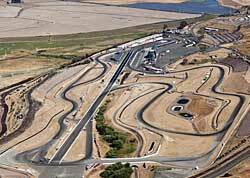 Sonoma Raceway, formerly Sears Point Raceway and Infineon Raceway is a 2.52-mile road course and drag strip located on the landform known as Sears Point in the southern Sonoma Mountains near Sonoma, California, USA. The road course features 12 turns on a hilly course with 160 feet of total elevation change. It is host to one of only five national NASCAR races each year that are run on road courses. It is also host to the IZOD IndyCar Series and several other auto races. GGR has not run an event at this track since 2010, however we’ve been invited by NASA to participate in a Porsche only run group at their Spring and Fall meet. Below is a video of our member Mike Ray in his GT3RS taken in March 2014 during the NASA Porsche only run group made up of PCA members. GT3 RS Sears Point with PCA GGR/NASA 3/16/14 from Mike on Vimeo.